There are very few online jobs you can do that require such in-depth knowledge and skills as being a media buyer. Performance marketers in general, and media buyers specifically, must take a huge range of skills into account in their daily work. From writing snappy content to designing custom creatives to landing page setup, measuring campaign ROI, tracking results and analyzing statistical data, basically, anything that makes life easier is a welcome sight. And because much of the work is repetitive in nature you’re gonna find performance marketers all over the world flocking to automation systems that can take off the strain. One area that’s often overlooked when mapping out a media buying strategy, is the handling of the files you’re gonna be using in the campaign. Media buyers depend on fast access to secure data. If you happen to be one, a sure way to make life hard and end up chasing your own tail is to not have an adequate cloud storage solution for your data. Whether it’s managing campaign creatives, keeping a tab on your HTML files or grouping spreadsheets together and backing up essential website files, being able to access your data quickly on-the-fly is crucial for your business. No longer are we always on the same desk, in the same office, at the same computer or even in the same country or state. One day we’re using our main workstation, the next – our laptop or tablet and all the while having important conversations on our phone. Everything is on the go today. We gotta adapt. The last thing you’re gonna want under these circumstances is files ion separate folders on different computers in multiple locations. No matter how good the file management system is on your device, you’re gonna be inviting a logistical nightmare in your life. Time is money and when a time-sensitive campaign is on the line, there’s no excuse for scrambling around for files and data that could cost you thousands in missed revenue. There are also numerous benefits to using secure cloud storage that’s gonna make you wonder how you ever lived without one in the first place and why you haven’t used it before. And, if you already use secure cloud storage for your media buying campaigns, we’re gonna show you a bunch of neat tricks to get much more out of your service. Perhaps the most obvious but frequently overlooked use for cloud storage is to back up your files. I say overlooked because while most people are aware of cloud storage, they only use it for a small section of their work, choosing to save most files on an existing hard drive when saving locally. This is risky because not only are you gonna limit your access to data, but also run the risk of duplicating files across two devices. Maintaining sync on all devices is actually a breeze and secure cloud solutions such as Dropbox have this functionality built in out of the box. You can even work locally and offline and files and folders will be automatically synced when you reconnect. Your data is gonna be more secure. With cloud storage, you’ve got the additional assurance that you aren’t gonna lose campaign data due to hardware failures or accidental deletion. You’re gonna be able to easily restore lost work in a few clicks. Add to this version and revision history, and you’re up for data recovery with minimal to no disruption. Now, I know what you’re thinking… Many performance marketers work for themselves. That’s true! What’s also true is that they (or even you) often have to collaborate with a team. This could be anyone – from your affiliate manager to the ad network support staff or a freelance designer who you’ve hired for a one-off project. Cloud storage solutions enable you to easily and readily share files and folders with everyone, so you can collaborate on a task without having to waste time tracking down files or sending over revisions by cumbersome means such as email (yuck!). It circumvents the need to store large file sizes, such as a video, on your personal machine so you can save time on landing page creation away from your desk. Let’s say you’ve got custom creatives stored in a shared folder accessible to your team. Your designer can easily make edits and upload revisions of the work, saving precious time on back and forth conversations or uploading and downloading files. Let’s take Dropbox as an example: free accounts with their 2GB of space have enough storage for personal use, but where the service really shines for affiliates is in the option to have up to 20GB bandwidth for data and 100,000 downloads per day. This is perfect for downloadable campaigns or incentivized lead generation such as free eBook downloads. You can get even more bandwidth with Dropbox Professional accounts (a max of 200GB per day plus unlimited downloads), so if your campaign goes viral on social media or you wanna increase your volume, there’s plenty of overhead to allow that. Of course, it doesn’t mean you can use Dropbox as a CDN for your creatives but you can definitely link to direct files such as PFS or image files, without the user having an account of their own. Simply append the link with ?dl=0 to ?dl=1 or ?raw=1 in order to switch between the downloadable and the raw version of your file. This makes sharing links super easy and with way less effort than uploading from a PC. Organizing your campaigns is gonna become a breeze thanks to the many folder management options rivaling those found on your desktop in quality. There’s also a plethora of plugins and integrations that come handy for keeping tabs on your keyword data and profit calculations (ex. : the Microsoft Office online plugin). Photos can be viewed in an online gallery, similar to the one on your smartphone, making it an effective way to search for campaign creatives and image files. Plus, with Dropbox’s Professional and Business plans, you can keep track not only of who’s viewed your file but when they last did. You can also access and restore prior synced file versions on your account, which can act as a handy backup and restore solution for your campaign creatives. If security is a concern, files can be encrypted, or permanently deleted from storage, or restricted by permissions that enable you to only share what you need with the people in your team. File organization and link sharing are some of the basic features that you are most likely already familiar with. There’s however a host of advanced features for media buyers to take their use of secure cloud storage to the next level. With secure cloud storage, you can keep your campaign creatives and landing page images all in one place, making it easy to track campaign objectives. The functionality to preview file sources means you can scan your work at a glance and with the showcase feature you get to share projects with clients without any need for coding. Remember that your mobile favorites are saved to local, so you aren’t gonna be able to access them on other devices. Already use Evernote? Then sync your data and add captions and text blocks, adjust layout, and preview your showcase before sharing. Super handy! One neat feature of premium plans is the option to brand your work. Nothing spells professional better than a slick brand. Media buyers are often gonna need to access bookmarks at a moment’s notice. With cloud storage, bookmarks to campaign links can be synced across all your devices and accessed from a single folder within your account. It’s also perfect for note taking – keep track of your daily tasks or save moments of inspiration for when you need them. An especially dope feature for social media marketers is the functionality to upload files directly to Facebook groups. No more having to manage separate files and accounts. Those of you who’ve got a website or a wiki to host and need to manage HTML and JS files, can create a public folder using a plugin called DropPages to serve these files to your domain. This is a game changer for staging sites or quick and dirty pages you wanna test before uploading to a server. It’s a great feature and one that I’m sure many media buyers are gonna find wildly useful. Apart from everything mentioned here, there’s also a plethora of task automation plugins and integrations to move files to your Google Drive, Amazon Kindle account, Evernote, Basecamp and Twitter, but bear in mind many of them are paid services. In the era of GDPR, it’s important to mention that Dropbox is HIPAA, HITECH & BAA certified. This means it’s an effective solution for any campaign that may include sensitive customer data (such as patient records). 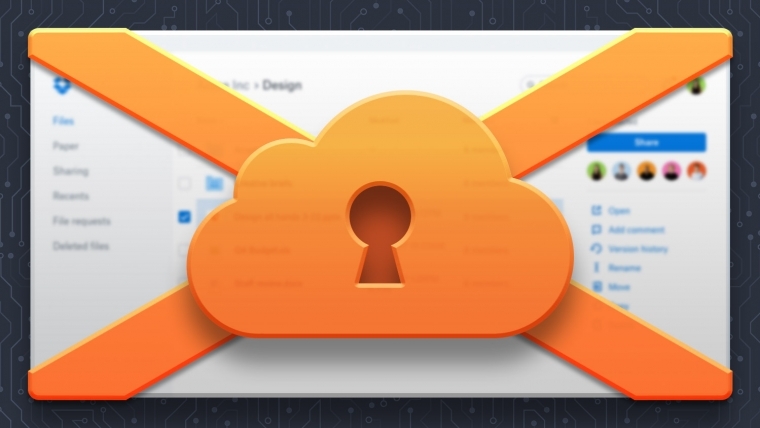 If you’ve reached this part and aren’t already using secure cloud storage for your campaigns, I pretty much recommend Dropbox as one of the longest existing and most advanced solutions on the market. In my opinion, it’s gonna save you valuable time, help you organize data and access it anywhere and on any device, and as a result – boost the success of your media buying campaigns because you’re gonna have more time to think about them now! Dropbox’s got its advantages even if you’re a Basic user. There’s a lot you can get from your initial 2GB of secure cloud storage. If you decide to go for Dropbox Plus, it gets even better. You sign up for 1TB of space and all the features I walked you through so far, minus of course the paid add-ons. For those of you who’ve turned your media buying gigs into a full-blown business, the professional tier is the option to consider. It’s gonna get you 2TB of space and will come with Smart Sync, Showcase, priority chat support options, with a monthly or an annual payment option. Or, you can shoot directly for the stars and land a 3TB Dropbox Business account that’s perfect for team collaboration and designed especially to fit the needs of enterprises. Basically, that’s my two cents on the subject. Can you think of other uses for cloud storage that have helped you manage your media buying campaigns more effectively? Editor’s note: This is a sponsored post for Dropbox. All opinions expressed here are mine. Dropbox is not affiliated with, nor endorses any other products or services mentioned.